So. Darker mornings. Bit colder. Sitting here on the train. The clouds are making funny shapes up there. There’s a couple of planes – could be taking people off to sunnier climes. But no … I’m sitting on this train. Fluorescent bike man to my right doing his best to melt my eyeballs. People who clearly live in barns – you do know there’s a button to close the f**king doors too don’t you? Yes of course your bag is a fare-paying passenger. Silly b***h! And stop with the b****y sniffing! Doing all this offline at the moment as there is no o2 signal here. No 2G, not even an o2 pigeon. Jeez it’s been a long time since I posted on here. As soon as I leave the o2 darkside I’ll find a picture to post. Darkside … now there was an amazing TV show. 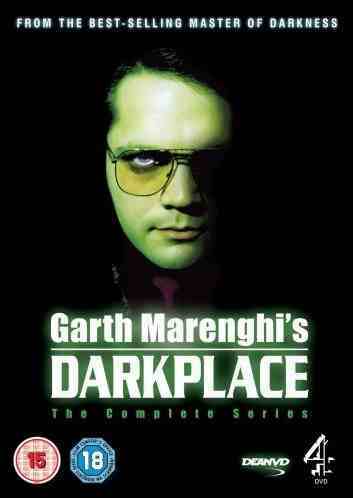 Garth Marenghi. I have the DVDs somewhere. You really should check it out. I think I’ll find you a picture soon. Why can’t we have the ‘chicken legs’ upholstery on our trains Greater Anglia? Why do we get the green with assorted microbes or the dark green with random lines? I think I have something else to do now. Candy Crush! Posted on September 25, 2014 by sausagenmash	• This entry was posted in 25z, Sepz, Thurz and tagged chicken legs, Darkplace, train. Bookmark the permalink.